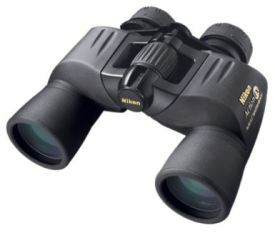 Nikon Action Binoculars are a favorite among birdwatchers due to the high quality construction for the price. They are rugged, have great optics and are easy on the wallet. As mentioned on our Best Binoculars for Bird Watching page, the Nikon Action Extreme ATB Ultra Wide Binoculars was chosen by Cornell to be the best bird watching binoculars in the economy category. The Nikon Action Extreme ATB Binocular Series is 100% waterproof and fogproof (nitrogen-filled and O-Ring sealed), and rubber armored for shock-resistance and a more comfortable and no-slip grip. Cheaper Models: All of these binoculars also come without water/fog-proofing at a little cheaper price, but we feel the extra cost is worth it, especially if you will be taking them on outdoor trips. Gives you some protection against unexpected :-) bumps and dips from the car to the field and back. The large exit pupils on these binoculars allows a large amount of light to transfer through and the multi-coated optics and high-index prisms (on all Action Extremes) provide sharp, bright images, especially when viewing at low-light levels. 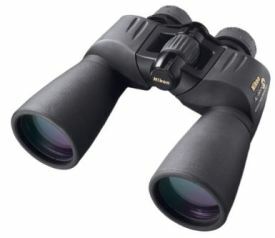 They are the lightest of the 3 most popular Nikon Action Extreme binoculars weighing 1.76 lbs. Close focus is 16.4 ft. Field of view is 489 ft at 1,000 yards. These are mid-size binoculars. 100% waterproof and fogproof. These provide a little more magnification than the 7x35s (8x vs 7x), and have a slightly larger objective lens, 40mm which makes them a little larger and heavier - but only .12 lbs heavier at 1.88 lbs. They have a slightly smaller field of view 429 ft vs 489 ft. They have the same close focus as the 7x35s at 16.4 ft. They are also considered mid-size binoculars. 100% waterproof and fog-proof. 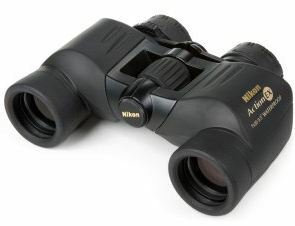 These Nikon Action binoculars provide both higher magnification and brighter images, but the larger objective lens will mean for heavier binoculars, and be slightly bulkier than the two previous binoculars. They are consider full size binoculars. If you don't mind the extra weight or perhaps will be using your binoculars just for backyard bird watching, you may want to consider these. Their weight is 2.24 lbs (nearly 1/2 lb heavier than the 7x35s, .36 lbs heavier than the 8x40s). They also have a further close focus at 23 ft vs 16.4 ft in the other two binoculars. 100% waterproof and fogproof. We hope you enjoy viewing birds, wildlife, stars, the game or whatever you want to see up close with your new Nikon Action binoculars. Enjoy your new bins! We have a few other pages about choosing bird watching binoculars with lots of information about what all the technical stuff means. We also discuss similar information here for spotting scopes and a summary of the best bird watching spotting scopes. Follow the links below. Nikon Monarch Binoculars - Review and comparison of all Monarch models including Monarch 3, Monarch 5, Monarch 7, Monarch X and Monarch ATB models. Nikon Monarch ATB 8x42 Binoculars Review - Our review of the Nikon Monarch binoculars.